The 76th Tata Steel tournament in Wijk aan Zee, the Netherlands witnessed world's number 2 Levon Aronian to defeat one of his main rivals, world's number 6 Fabiano Caruana. Levon Aronian and Fabiano Caruana .during the game white got a slight edge and Black decided to sacrifice a pawn in order to be able to finish his development. Aronian managed to keep his extra pawn, and this became a dangerous runner on the a-file that eventually decided the game. The game preceded with Wesley and Hikaru Nakamura the first to finish; they drew a Triangle Slav where White got the bishop pair but Black got easy piece play. Boris Gelfand started with 0.0/2 as he lost to Richard Rapport, who played the Budapest Gambit and the third winner was Anish Giri, who won against Arkadij Naiditsch. Anish Giri won a game against Arkadij Naiditsch, who also lost in the first round. After the game was played, Naiditsch lost the thread and his king got stuck in a mating net. Sergey Karjakin is theoretically very well prepared regarding 1.d4. He went for the 5.Bf4 Queen's Gambit Declined and Pentala Harikrishna, he even tried Kf8 as it was a deviation from the high-profile blitz game Kasparov-Kramnik. According to this strategy, White's tiny edge a better bishop shouldn't be enough to win at this level. The 76th Tata Steel Chess Tournament started on 10th January 2014 in Ijmuiden, Wijk aan Zee. 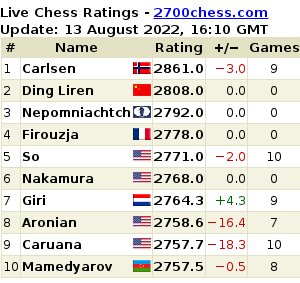 The tournament has participation like Levon Aronian and Polish GM Radek Wojtaszek, tops the Challengers at the moment. Dutch chess legend Jan Timman and Dimitri Reinderman will also be present. This year’s 76th edition will have two GM groups instead of three. 18-year-old IM Benjamin Bok , IMs Merijn van Delft and Etienne Goudriaan qualified from last year's nine-round event will also be part of the game.